MichBusiness has received the 2019 WOMEN BUSINESS ENTERPRISE – DIVERSE SUPPLIER ACHIEVEMENT AWARD from Blue Cross Blue Shield of Michigan. BCBSM held its annual supplier diversity achievement awards on March 13, 2019, at the Whitmer Auditorium in Detroit. 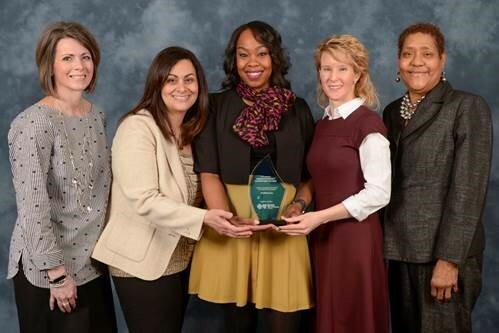 The award is presented to a woman-business enterprise that provides outstanding customer service, keeps Blue Cross Blue Shield of Michigan informed of industry trends and developments, brings forth cost savings ideas, and aligns to Blue Cross’ goals and objectives. While MichBusiness and BCBSM have had a decades-long collaborative partnership, the benefits to members increased last year as the organization was certified as a Women-Owned Business. Together, Blue Cross and MichBusiness have created and successfully launched a Woman Business Enterprise health insurance program that provides an added benefit to their corporate members who report diversity spend to their customers. MichBusiness has been known for its insurance offerings over the past 30 years, through a partnership with Blue Cross Blue Shield of Michigan and Blue Care Network. Now, you can apply health insurance premiums towards your diversity spend without losing quality coverage, while still working with your own insurance agent. As a certified Woman-Owned Business through the Women’s Business Enterprise National Council (WBENC) and in partnership with Blue Cross Blue Shield of Michigan and Blue Care Network, MichBusiness is able to provide insurance billing services in support of your Supplier Diversity Spend Program. With a Thrive level membership, you can take advantage of this opportunity to count all health insurance premiums toward your WBE (Woman Business Enterprise) spend goals. To enroll in the WBE Insurance Program or for more information, contact our team today at info@michbusiness.com or 586-393-8800. Thrive members have access to all of the MichBusiness insurance offerings, including the ability to count health insurance premiums toward their WBE (Women Business Enterprise) spend goals. *eligibility is required, and administrative HR support including ACA, ERISA and COBRA compliance solutions and back-office support for insurance related changes. Thrive members are also given a choice to select an ad package in Corp! Magazine (maybe include hyperlink to corp’s website here); or attendance at one of Corp’s or MichBusiness’s community signature programs. All Thrivers receive a complimentary copy of the Business Resource Guide, which compiles best practices from the Best and Brightest Companies to Work For (maybe include hyperlink to B&B website). Thrivers also will receive free scoring and benchmarking reports if they choose to nominate their company as a Best and Brightest Company to Work For. Thrive members are offered preferential seating at our events, custom packages to include booths, logo exposure, or tickets, at deeply discounted prices. Thrive memberships include all of the benefits that Pathfinder memberships do as well. From discounted HR programs to insurance compliance solutions, we have the support your company has been looking for. A Supplier Diversity program is a business strategy that ensures a diverse supplier base in the procurement of goods and services. These programs promote the inclusion of historically disadvantaged groups, such as women, minorities, veterans, and members of the LGBTQ community. Supplier Diversity programs foster an environment of competitive products and services while breaking down barriers of entry and leveling the playing field. For more information on how your company can become a certified diverse-owned business or get started with a supplier diversity spend program, please contact our team! Promotes innovation through the agility usually found in small businesses. Provides multiple channels for procuring goods and services. Affirms your company’s commitment to creating an inclusive community. Increasing supplier base drives competition, often resulting in lower prices. The largest certifier of women-owned businesses in the U.S. and a leading advocate for women business owners and entrepreneurs, The Women’s Business Enterprise National Council engages, certifies, supports and encourages the development of women-owned businesses. Visit wbenc.org to learn more. WBENC Certification validates that a business is at least 51 percent owned, controlled, operated and managed by a woman or women. More than 1,000 corporations representing America’s most prestigious brands are corporate members of WBENC, and are seeking to do business with diverse, women-owned companies. Learn more about WBENC certification.